Ella arrived this afternoon in the midst of strong wind and heavy rain. I heard something banging around on the porch and went to investigate. I thought maybe a branch had fallen. When I opened the door, something whizzed past me into the kitchen. There was more thumping and bumping and I turned to see Ella, dripping wet, sling her suitcases into the hallway. I tried to welcome her, but she shot past me on her way to the linen closet. 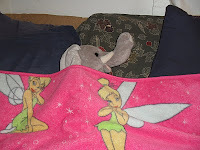 She hastily grabbed a towel, dried off and continued down the hall where she climbed right up into Colleen's bed.Tucking herself in with Colleen's favorite blanket, she went off to sleep without a word. Penny heard all the commotion and told Perdy something was up. They sneaked into Colleen's room and saw Ella fast asleep. Perdy mentioned to Penny that Ella had the right idea. Both agreed there was nothing better on a cool, windy and rainy day than a nice nap. As Penny and Perdy gingerly lay down, Ella stirred. Realising there was no danger, Ella settled herself and went back to sleep. I picked up Ella's suitcases and took them into the guest room and put her things away. I hope she won't mind moving to that room when she wakes. 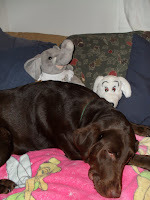 There will be a ruckus if Colleen comes home and finds two dogs and an elephant in her bed! That Ella! I swear, she has no manners! I gave her explicit instructions to introduce herself and thank you politely for allowing her to visit. She did make good time getting to your house though. I was hoping she might arrive by tomorrow but figured she wouldn't actually get there until Monday. Where did this elephant come from?! She's hoggin' my bed and refuses to relocate to the other room! I don't want to be rude to guests, but I am not giving up my room to an ELEPHANT! Oh! I have the perfect gift for her before she leaves! I will be sure to get it to you by the weekend! UGH! I send her off with manners, but somewhere along the way she always loses them! It is JUST like her to make herself right at home! (i think she comes by that part naturally...) Pooooor Colleen... perhaps if you place some macadamia nuts in the guest room... those are her favorites. Amazingly, she behaved quite well at my house. Melli thinks that is because she had a crush on my youngest boy.